Just a few chapters into Mark’s gospel, those around him are saying he’s crazy and want to get him under control. Now, saying someone is “crazy” or “out of his mind” is strong language. It can be a way to discredit people, to dismiss their views and actions, to limit or destroy their credibility. Karoline Lewis suggests that accusing Jesus of being “out of his mind” could have made sense, because a life following Jesus, a life lived for the sake of the Kingdom of God, a life committed to a Gospel way of being doesn’t make sense” in the eyes of the world. In the context of first century Palestine, how do you understand a life that seems to be counter to societal norms, the standards of religious righteousness and piety, and political orientation. So, what would it take for you to say somebody is out of his mind? What if they hold very different beliefs from you? Or are at the other end of the political spectrum than you are? Do they behave in ways that are hard for you to understand? 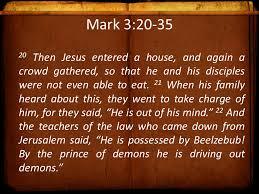 Jesus has been healing people and casting out demons and even doing these things on the Sabbath. The Pharisees are accusing Jesus of breaking the Sabbath. The scribes are interpreting Jesus’ behavior as proof that he’s possessed by a demon, which in ancient times was often thought to be the cause of insanity. In the ancient world, people who were possessed by a demon, or born with some physical or mental illness or defect, were often assumed to be cursed or to have sinned. Jesus has been challenging norms about who’s in and who’s outside the realm of God’s grace. He’s been forgiving and healing all who are in need. Everyone. No exceptions. In an age when family was everything, Jesus was even re-defining the meaning of family. Those who do the will of God are his true brothers and sisters and mother. Jesus has been shaking up the people around him, and even his own family is trying to get him under control. What the world calls wretched, Jesus calls blessed. Blessed are the poor and the poor in spirit. Blessed are those who are merciful and compassionate. Blessed are those who hunger and thirst that God’s righteous justice might prevail. Blessed are those who work for peace. Blessed are you who are persecuted for trying to love and do what is good. To a lot of people, these ideas sound crazy! Some others might say, these are nice ideas, but they’re impractical or impossible. Harriet Beecher Stowe was born in 1811 into a devout family committed to the gospel of Jesus and to helping transform the world. She is best known for her novel, Uncle Tom’s Cabin, which depicts the harsh conditions for enslaved African Americans. The book reached millions as a novel and as a play. It became influential in the United States and Great Britain, and energized anti-slavery forces in the American North, while provoking widespread anger in the South. Beecher Stowe once explained her anti-slavery writing this way: “I wrote what I did because as a woman, as a mother, I was oppressed and broken-hearted with the sorrow and injustice I saw; because as a Christian I felt the dishonor to Christianity; because as a lover of my country, I trembled at the coming day of wrath.” So, she did what she could to set the captives free. In her fictional book, Harriet Beecher Stowe told the truth. She told the story of how chattel slavery afflicted a family, of real people. She told the truth of the brutality, the injustice, the inhumanity of the institution of chattel slavery. Her book did what YouTube and Facebook videos of injustices and brutalities do today. Today, we’d say Uncle Tom’s Cabin “went viral.” It rallied abolitionists and enraged those with vested interests in slavery. Was Harriet Beecher Stowe crazy? A woman of her social standing was supposed to marry well, raise well-mannered, successful children, and participate in a few charitable endeavors, along with managing the household. A woman of her time was supposed to write nice stories-- not stories that would disturb the conscience of a nation. You may remember that after the death of Steve Jobs, one of the founders of Apple, an old commercial from the 1990’s went viral on the internet. In the commercial they showed a collage of photographs and film footage of people who have invented and inspired, created and sacrificed to make a difference in the world. As the images roll by, a voice reads the poem that begins, “Here’s to the crazy ones. The misfits. The rebels. The troublemakers. The round pegs in the square holes…. Back in 1990, in my third year at Princeton Seminary, I was part of the touring choir that visited South Korea for ten days during spring break. Both of the Sundays we were there, we sang at four different worship services. On one of the Sundays, we sang at a 6:00 a.m. service. Mercifully, it was the second service of the day. The first one started at 5:00 a.m. Following the service, our host church had planned a big breakfast for us. One of the church elders at our table grinned at us and said, “You must think we’re crazy to come to God’s house this early.” Being a bit sleepy and wanting to be polite, I assured him that I didn’t think they were crazy. But that was the wrong answer. To a lot of people, it’s crazy to say that God loves everyone the same, because this just isn’t how the world works. To a lot of people, it’s crazy to priotize the integrity of families--all families, even immigrant and refugee families-- above “border security.” To a lot of people, it’s crazy to think we could have enough food and decent housing and safe water and adequate health care for everyone-- enough for everyone. God’s dream inspired the Hebrew prophets who proclaimed “Thus says the Lord” when they spoke truth to power and courageously challenged injustice and mistreatment of the poor. The Bible and our Christian faith point beyond themselves to the vision, the purposes, and the desire of God. Jesus talked about the kingdom or reign of God as the realization of God’s loving dream and vision for the whole human family and all of God’s creation. I believe when we actually study the scriptures and listen for and hear God’s word to us, we will begin dreaming God’s dream, and maybe some of us will be crazy enough to trust in the dream and stake our lives on it. Then we can live into God’s dream for all of us. Imagine it: a world where no child ever goes to bed hungry again. A world where everyone has a safe place to call home. A world in which poverty is truly history, a thing of the past. A world in which every person is treated and valued equally as a beloved child of God. A world where we lay down our swords and shields and guns and bombs, to “study war no more.” A world reconciled to our God and to one another, as children of God and brothers and sisters of one another. Friends, are we crazy enough to catch a glimpse of the transforming, life-changing vision of our Lord and Savior Jesus Christ? Jesus invites us to follow him…to witness to God’s amazing, inclusive love, and to work with him to fulfill God’s dream for all people and all creation. We have Christ’s promise that he will be with us always. We can trust that God’s goodness is stronger than evil and that and God’s love will eventually conquer all. Contemporary English Version (CEV), 1995. I am very indebted to Bishop Michael B. Curry for his articulation in Crazy Christians of some of the deepest longings of my life and faith.